Lots of things to discuss tonight. Irony: today I received an envelope from Bloomsbury, the publishing house, containing a hardcover copy of the 50th anniversary edition of Gay Talese’s The Bridge, about the building of the Verrazano-Narrows Bridge. That was a $2,000 triple-stumper on tonight’s show. More chatter in the video. This one’s straightforward. Shane should wager 3,200 to cover Rena. 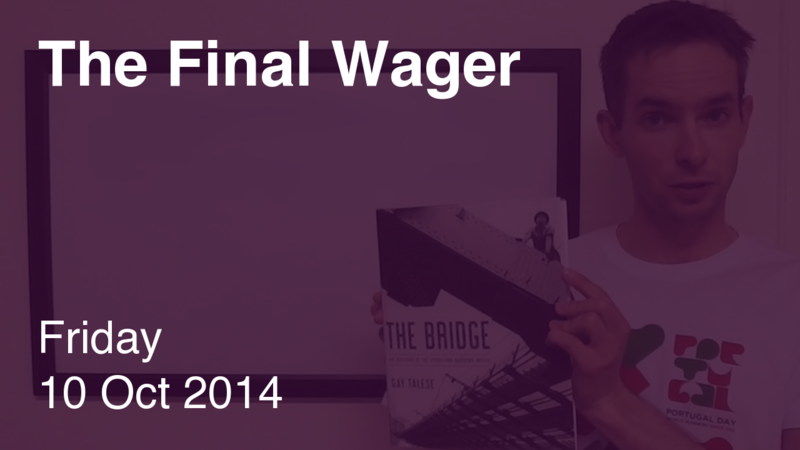 Rena needs to get it right and wager at least 2,800, so she might as well wager everything. Elizabeth is out of contention for the victory. Assuming Rena makes the bare minimum wager of 2,800, Elizabeth would need to get it right and wager at least 2,601 to pass her. I suppose she could also wager 599 in case Rena goes for the 6,000 wager to cover a zero by Shane.